This week your friends from A man A plan A canal are digitally servicing Tell My Sister, a special three-disc set consisting of remastered versions of the Canadian duo Kate and Anna McGarrigle’s beloved 1976 self-titled debut; its equally praised 1977 follow-up, Dancer with Bruised Knees; and a collection of previously unreleased songs, including solo and duo demos. 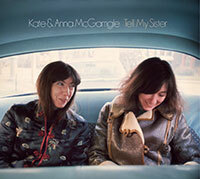 This release coincides with the one year anniversary since Kate McGarrigle’s passing. Since this is a three-disc box-set, this will be a digital servicing only. To download each album, click on the links below.